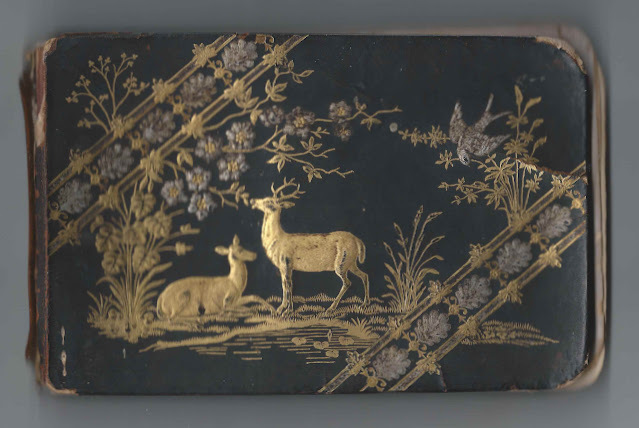 1880-1917 autograph album of Mary (Williamson) Stevens Barstow of Marshfield, Massachusetts, with some autographs collected during her widowhood after her first husband Ray Stevens had died, and some collected after her second marriage to Augustus Pope Barstow. The first end paper has the name of Irene Powers in a modern type ink. Irene may have owned the album in a later era. The album is approximately 7-1/2" x 5" and contains the sentiments of well over 100 of Mary's relatives and friends. An alphabetical list of the signers appears at the end of this post. A few pages have what appear to be hand done illustrations. One of them has initials A. W. W beneath the painting of violets, on a page signed, appropriately, by Addie W. Williamson, Mary's niece who lived at Marshfield, Massachusetts. Whether Addie did all of the illustrations, I don't know, but, interestingly, another appears on a page signed by her mother, Martha Ann (Tucker) Williamson, whose husband was signer Job Williamson, Mary's brother. There are four colored illustrations in all, plus a black and white sketch of a bird done by William C. Chandler of Marshfield, Massaschusetts. Many the signers were related and inter-related. The surnames will be familiar to anyone who has researched Marshfield and Duxbury, Massachusetts families. If you can clarify some of the relationships that are noted in the alphabetical list of signers, please leave a comment or contact me directly so that I can make any needed changes. Mary Williamson was born 22 February 1841 at Marshfield, Massachusetts, the daughter of Calvin and Julia Hatch (Delano) Williamson. On 13 December 1860, Mary married Ray Stevens, son of Nathaniel and Lucy (Bourn) Stevens. Mary and Ray had a daughter, Lucy Mary Stevens, born 5 October 1864 at Marshfield, Massachusetts. Lucy signed two pages in her mother's album, one on January 18, 1881, before her marriage to Henry Alden Clark, and again, on January 3, 1892. Henry also signed that later page, but earlier, on March 16, 1889. Lucy and Henry's daughter Nettie Stevens Clark, born 9 November 1892 at Marshfield, Massachusetts, signed an undated page in her grandmother Mary's album. Ebenezer Alden and Maria L. Alden, signed at Marshfield, Massachusetts, on May 25, 1881. Maria was Maria Louisa (Dyer) Alden. Lulie Ames, signed at Marshfield, Massachusetts, on May 26, 1881. Middle initial might be T, Y or ? Mary (Williamson) Stevens Barstow, album owner. Eliza W. Barstow, signed at Marshfield, Massachusetts, on November 21, 1892. She was visiting Marshfield, Massachusetts, but was then living in Montana with Charles H. Barstow, who was either her father or her brother, and with whom she shared the page. Sarah Barstow, signed at West Duxbury, Massachusetts, on December 7, 1890; "sister". She was Sarah E. (Randall) Barstow, whose husband Lewis B. Barstow was a brother to Mary (Williamson) Stevens Barstow's second husband Augustus Pope Barstow. Minnie G. Barstow of Duxbury, Massachusetts, signed at Marshfield, Massachusetts, on March 5, 1884. Later note: "Mrs. Edward B. Slocum". Minnie was Mary G. Barstow, daughter of Hiram and Lucy Ann (Gibbs) Barstow and, as noted, wife of Edward B. Slocum. Augustus P. Barstow of Marshfield, Massachusetts, signed on November 27, 1892. Second husband of album owner Mary (Williamson) Stevens Barstow. B. Parker Barstow, signed on October 21, 1881. He was Benjamin Parker Barstow, son of Henry and signer Helen Jane (Ford) Barstow. Alliston S. Barstow of West Duxbury, Massachusetts; shared the page with his sister Clara A. Barstow. They were the children of Augustus Pope Barstow and his first wife Clara (Shepard) Barstow and the stepchildren of Mary (Williams) Stevens Barstow. Clara A. Barstow of Marshfield, Massachusetts, signed on November 27, 1892. They were the children of Augustus Pope Barstow and Clara (Shepard) Barstow and stepchildren of Mary (Williamson) Stevens Barstow. Helen Lena Brett of North Easton, Massachusetts, signed on April 25, 1903. She would marry Alliston Shepard Barstow, son of Augustus Pope Barstow and Clara (Shepard) Barstow and stepson of Mary (Williamson) Stevens Barstow. 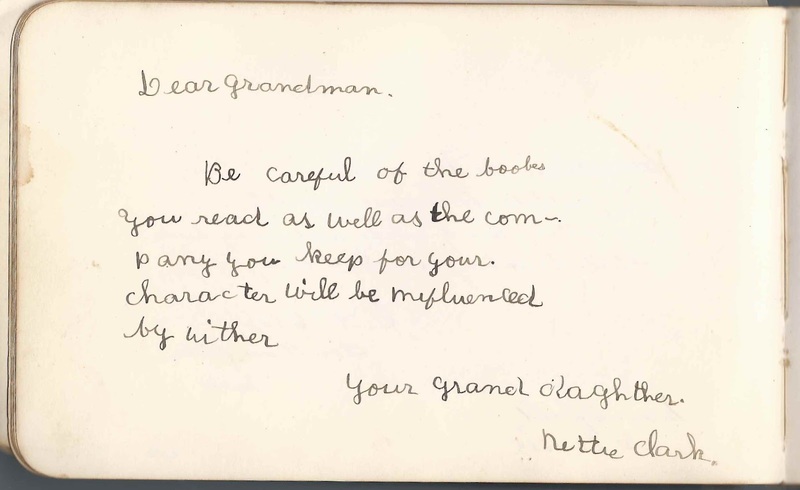 Hattie L. Chandler, signed at Marshfield, Massachusetts, on September 18, 1899; her father Frank Ellsworth Chandler shared the page with her. Hattie's mother was Martha Jane (Williamson) Chandler, a niece to album owner Mary (Williamson) Stevens Barstow. Frank E. Chandler of Marshfield, Massachusetts, signed on October 7, 1899; he was Frank Ellsworth Chandler, who shared the page with his daughter Hattie Louise Chandler. Frank was the widower of Martha Jane (Williamson) Chandler, niece of album owner Mary (Williamson) Stevens Barstow. William C. Chandler of Marshfield, Massachusetts, signed on September 18, 1899; he sketched a bird on a flowering branch. He was William Carleton Chandler, son of signer Frank Ellsworth Chandler and Martha Jane (Williamson) Chandler, who was the niece of album owner Mary (Williamson) Stevens Barstow. Nettie Clark, your granddaughter. Nettie was Nettie Stevens Clark, daughter of Henry A. Clark and Lucy Mary (Stevens) Clark, daughter of Ray and Mary (Williamson) Stevens Barstow. Henry A. Clark of Marshfield, Massachusetts, signed on March 16, 1889; he shared the page with his wife Lucy Mary (Stevens) Clark, daughter of album owner Mary (Williamson) Stevens Barstow. Clara E. Crosby and Carrie R. Crosby, signed at Milford, New Hampshire, in 1882. Added note under the name of Clara E. Crosby: Mrs. Cyrus Patch. Clara and Carrie were the daughters of Frederick and Rebecca (Rand) Crosby. A. F. Delano of Marshfield, Massachusetts, signed on January 31, 1885. He was Alphonso Fay Delano, whose wife Emma L. (Stevens) Delano signed the right facing page. Emma L. Delano, signed at Marshfield, Massachusetts, on February 2, 1885, whose husband Alphonso Fay Delano signed the left facing page. Emma's sister Susie B. Stevens also signed a page. Marcia C. Delano of Marshfield, Massachusetts, signed on January 13, 1884. Later note: "Mrs. William Rand". Miss Nellie Fernald of West Duxbury, Massachusetts, signed on October 18, 1887 [or 1881]. Middle initial might be M. or N. or ? Elisabeth C. R. Gleason of Marshfield, Massachusetts. Later note: "Died May 24, 1883"
Eva M. Gridley of Southampton, Massachusetts, signed at Marshfield, Massachusetts, on September 14, 1891. Luther Hatch of Marshfield, Massachusetts, signed on "12/9/91"
Fannie C. Hatch, signed on December 7, 1891; shared the page with her sister Grace P. Hatch. They were daughters of signers Luther and Elizabeth Hatch. Grace P. Hatch, signed on January 16, 1892 at Marshfield, Massachusetts; shared the page with her sister Fannie C. Hatch. They were daughters of signers Luther and Elizabeth Hatch. Bernice Leslie Holmes, signed on "April 3, 4, 5 & 6/07"
Samuel E. Low of Marshfield, Massachusetts, signed on February 1, 1881; his wife Sarah K. (Sprague) Low signed the right facing page. S. K. Low, signed at Marshfield, Massachusetts, on February 1, 1881. 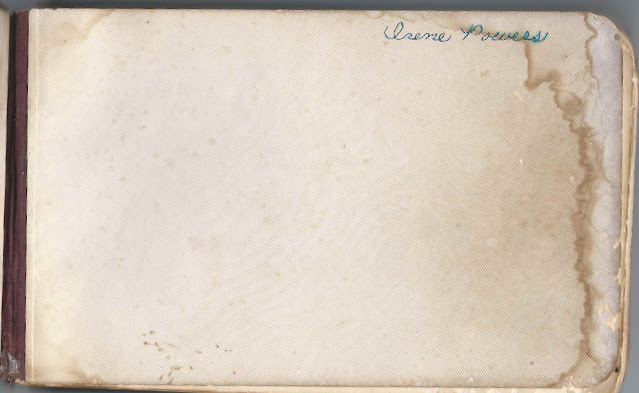 She was Sarah K. (Sprague) Low, wife of Samuel E. Low, who signed the left facing page. 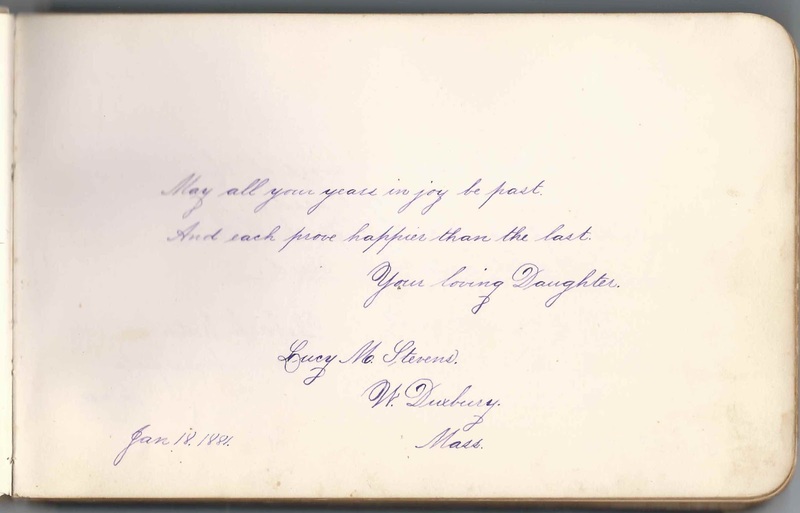 Lois A. Manning, signed at Marshfield, Massachusetts, on August 30, 1899; shared the page with her son Frederic W. Manning. H. A. Peabody. He was Herman Addison Peabody, husband of Mildred Matilda (Gutterson) Peabody, who signed the right facing page. Mildred M. Peabody of Milford, New Hampshire, signed on February 18, 1882. She was Mildred Matilda (Gutterson) Peabody, wife of Herman Addison Peabody who signed the left facing page. 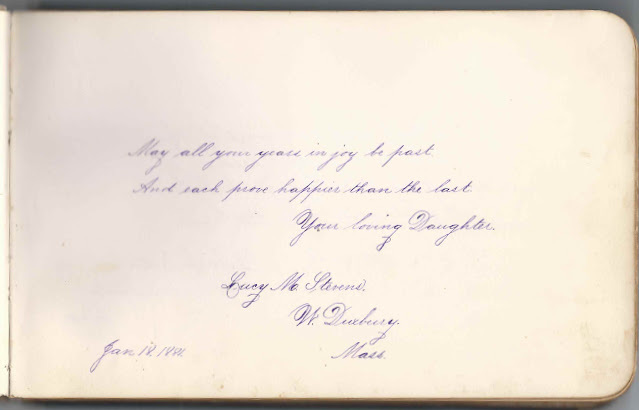 Ernest A. Peabody of Milford, New Hampshire, signed on February 18, 1882. Son of signers Herman Addison Peabody and Mildred Matilda (Gutterson) Peabody. Charles H. Peck, signed on February 17, 1917, at the Marshfield Manse. He was Rev. Charles H. Peck, minister at the First Congregational Church at Marshfield at the time he signed the page, which he shared with his wife Helen E. Peck. Helen E. Peck, signed on February 17, 1917 at the Mansfield Manse. She was the wife of Rev. Charles H. Peck, who shared the page. Emma L. Peterson of West Duxbury, Massachusetts, signed on October 9, 1881. Later note: "Mrs. Horace Belknap". Elisha P. Sprague of Marshfield, Massachusetts, signed on October 7, 1883. His wife Lucy A. (Cushman) Sprague signed the right facing page. Lucy A. Sprague of Marshfield, Massachusetts. She was Lucy A. (Cushman) Sprague, wife of Elisha P. Sprague, who signed the left facing page. 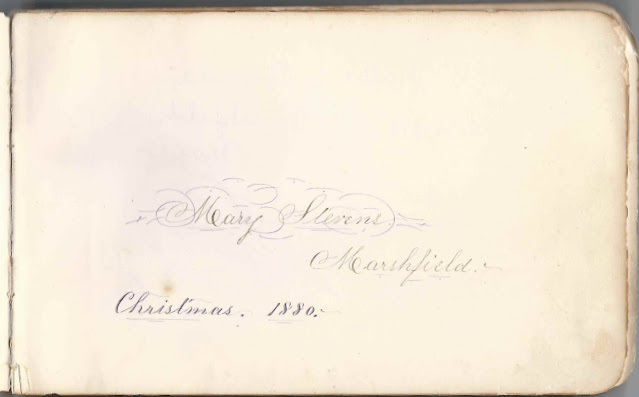 Mary Stevens of Marshfield, Massachusetts, signed at Christmas 1880. She was album owner Mary (Williamson) Stevens Barstow, whose first husband Ray Stevens had died in 1867. She married Augustus Pope Barstow in 1885. Susie B. Stevens, signed at Centre Marshfield, Massachusetts, on January 23, 1885; cousin to Mary, presumably through her first husband Ray Stevens. She was the daughter of Daniel and Susan Stevens; her sister Emma and husband Alphonso F. Delano also signed pages in the album. Lucy M. Stevens of West Duxbury, Massachusetts, signed on January 18, 1881. She was Lucy Mary Stevens, daughter of Mary (Williamson) Stevens Barstow and her first husband Ray Stevens. Lucy signed another page in the album, after her marriage to Henry A. Clark. Lucy M. Stevens of West Duxbury, Massachusetts, signed on January 18, 1881. She was Lucy Mary Stevens, daughter of Mary (Williamson) Stevens Barstow and her first husband Ray Stevens. 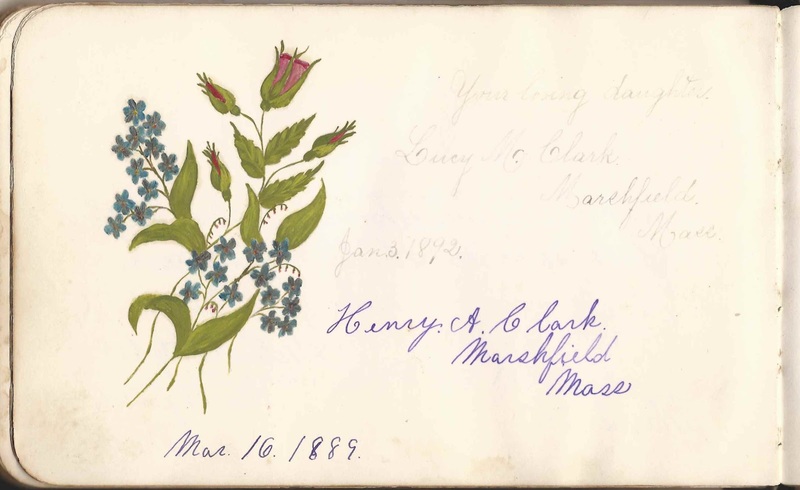 Lucy signed another page in the album on March 16, 1889, after her marriage to Henry A. Clark. Mary F. Trask of Milford, New Hampshire, signed on September 18, 1887. Belle L. Washburn of Peterborough, New Hampshire, signed on January 9, 1882. Later note: "Mrs. C. F. Devaul"
Harriet T. Weston of Marshfield, Massachusetts, signed on October 9, 1900. She was Harriet T. (Preble) Weston, wife of John W. Weston. Alice P. Whitman of Pembroke [presumably Pembroke, Massachusetts], signed on "10-5-1881". Later note: "Mrs. Ed Litchfield". He was Edwin P. Litchfield. 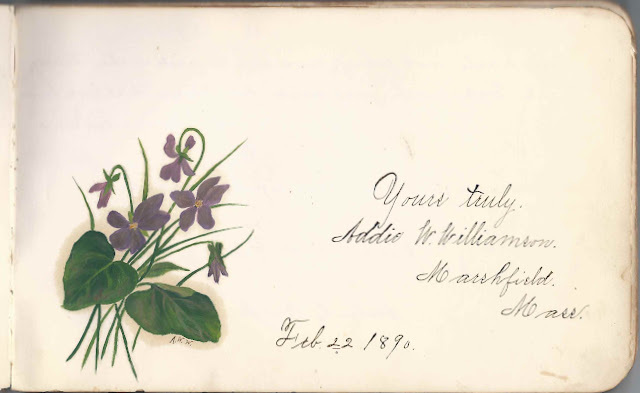 Addie W. Williamson of Marshfield, Massachusetts, signed on February 22, 1890; she painted violets and foliage. Her parents, Job and Martha Ann (Tucker) Williamson also signed pages. Job Williamson was a brother of album owner Mary (Williamson) Stevens Barstow. Eudora B. Williamson of Marshfield, Massachusetts, signed on December 2, 1899. She was the Eudora (Peterson) Williamson, wife of Mary (Williamson) Stevens Barstow's older brother Peter Williamson and mother of signers Eudora Mabel Williamson and Alice Alma Williamson. Job Williamson of Marshfield, Massachusetts, signed on December 9, 1882. His second wife Martha Ann (Tucker) Williamson signed the right facing page. Job was a brother to album owner Mary (Williamson) Stevens Barstow. Martha A. Williamson, signed at Marshfield, Massachusetts, on February 2, 1883. She was Martha Ann Tucker, whose husband Job Williamson signed the left facing page. 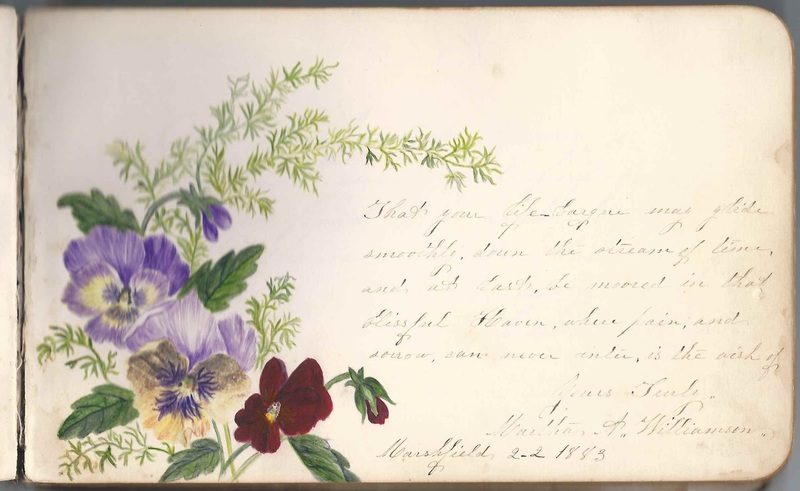 Martha, or perhaps her daughter, signer Addie W. Williamson, painted a spray of pansies. Eudora Mabel Williamson of Marshfield, Massachusetts, signed on December 1, 1899; shared the page with her sister Alice Alma Williamson. They were the daughters of Eudora (Peterson) Williamson and Peter Williamson, older brother of Mary (Williamson) Stevens Barstow. Alice Alma Williamson of Marshfield, Massachusetts, signed on December 1, 1899; shared the page with her sister Eudora Mabel Williamson. They were the daughters of Eudora (Peterson) Williamson and Peter Williamson, older brother of Mary (Williamson) Stevens Barstow. William Williamson of Marshfield, Massachusetts; possibly Mary (Williamson) Stevens Barstow's older brother or another relative. J. Williamson, signed at Pescadero, California, on May 27, 1884. He was Josiah Caldwell Williamson, son of William and Ann (Caldwell) Williamson. William Williamson was an older brother of album owner Mary (Williamson) Stevens Barstow. Josiah's wife Hattie J. Williamson signed the right facing page. Hattie J. Williamson of Pescadero, California. Her husband Josiah Caldwell Williamson signed the left facing page. Mattie Williamson of Marshfield, Massachusetts. Later note: "Mrs. F. E. Chandler". Mattie was Martha Jane Williamson, the daughter of Job Williamson and his first wife Lucretia (Harrington) Williamson. Mattie married Frank Ellsworth Chandler. Job Williamson was a brother to Mary (Williamson) Stevens Barstow.